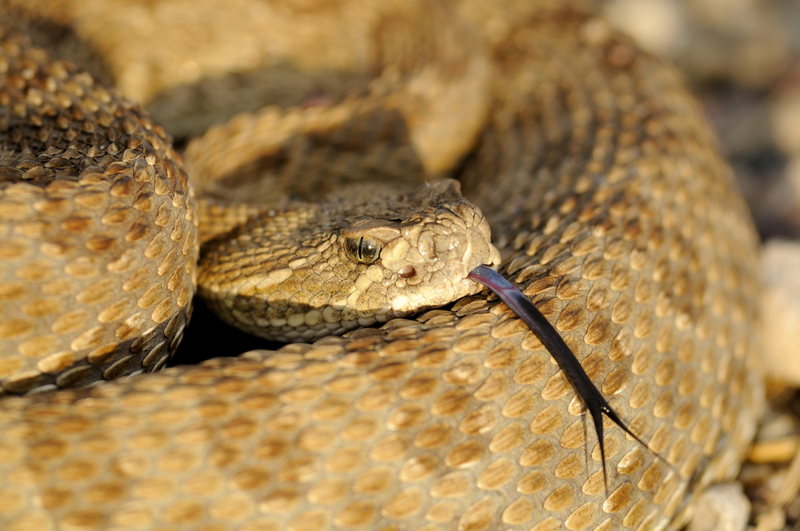 This recent Denver Post story reminded us that it is definitely rattlesnake season and that your pets are just as likely, if not more so, to encounter these cold blooded beasts as you are. The first tip is to get the Rattlesnake Vaccine for your pet. It’s made by Red Rocks Biologics and is available for both dogs and horses. This is a great preventative measure since, according to their website, approximately 300,000 dogs and cats are bitten by rattlesnakes each year. Keep your dog on a leash – preferably a short one. If you’re going to be out in the wilderness on a trail with Fido, then keep him on a short leash. This way if you see a snake ahead of you on the trail, you can pull back and keep you both safe. If Fido is off leash or on a longer leash, he may be too close to the snake before he realizes what it is. Don’t go wandering. Maybe this isn’t the time of year to take off across an Arizona prairie. Stick to the trail so that it’s easier to see what’s around you. There are some ways to protect your backyard too. A chain-link fence won’t keep a snake out, but a solid wood one, with no gaps, will go a long way towards fortifying your yard. You can also add a concrete barrier around the yard as part of your fencing. If you DO see a snake ahead of you on the trail, back away slowly with your dog. Once you’re a safe distance away (the length of the snake is as far as it can strike) turn and walk back the way you came. If your dog is bitten, get it to the vet immediately! Here in Grand Junction if this happens outside of your vet’s normal office hours, there are 2 emergency centers you can go to: Grand Valley Veterinary Emergency Center and Orchard Mesa Veterinary Hospital.